It seems this blog has finally come full circle. Back in 2007, I had the chance to see Styx & Def Leppard in concert. 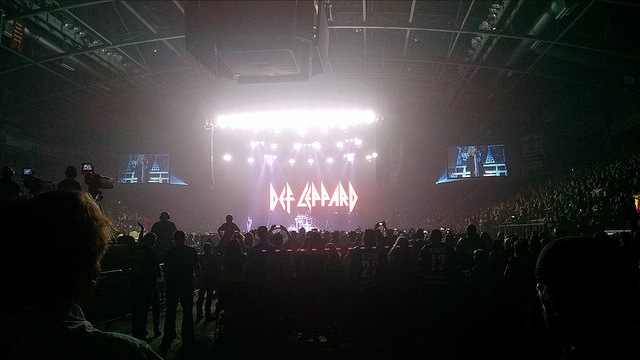 Last night, on April 22, 2015, I saw Def Leppard for the second time at the Saddledome in Calgary, Alberta, and here I am writing another review. This time, they were not accompanied by Styx, though it appears they will be joining DL on the US leg of their tour (incidentally, they’re touring UK and Ireland with Whitesnake). With a new album coming out this fall, it may not be long before they return to Calgary again. Before I get into this review in earnest, I should let you know that I presently play bass guitar in a Def Leppard cover band. I used to be a part of the same band a couple of years back, but at the time I was playing guitar instead of bass. As such, it’s pretty incredible how familiar every beat and every change in most DL tunes has become for me. I certainly wouldn’t say that we’re on the same level as Def Leppard as a band, but I feel like I know the songs pretty intimately at this point. For example, during the concert, just by force of habit, I was singing along with all of the gang vocal and harmony parts instead of the lead parts sung by Joe Elliott. This is also due to the fact that Def Leppard’s set list last night was not that different from ours as a cover band. There were only three songs throughout the entire night, “Paper Sun”, “Two Steps Behind”, and DL’s version of “Rock On” (originally by David Essex), that we don’t play in our set. All the other tracks, from “Hysteria” to “Animal” are part of our regular repertoire, and are deeply embedded in my mind. I was also pretty familiar with the three songs we don’t play, but I’ll explain why in a second. I can’t fully explain why, but I’ve come to appreciate DL’s music a lot more as of late. I’ve been listening to Slang, Euphoria, X, as well as Yeah! quite a lot lately. I’ve also had 2013’s Viva! Hysteria DVD playing in the background while working quite often these days. It’s almost as if I knew I would be going to last night’s DL concert, and I was studying up in advance. Of course, I didn’t know for sure that I would make it, and that I might end up sending my sister in my place. It worked out such that both my sister and I could go, so we took advantage of that time to let loose and have fun. I could sit here and talk about the finer details of the concert and critique the little things (and believe me, I will get into more detail in a second), but man, if you’re not going to enjoy yourself at a concert, why go at all? So, in short, I was primed for this concert. The band was probably the most relaxed that I’ve ever seen. They still rocked out without a doubt, but they didn’t really seem to have anything to prove. Of course, we are talking about a band with a rich discography, several multi-platinum albums, and an incredible number of mainstream hits. I think that’s the part that people often forget about DL, and when you begin to understand exactly how many recognizable hits they have, you can’t help but acknowledge their versatility, talent, and charisma; whether you like them or not. There weren’t too many surprises throughout the show; at least not for me. Again, I think this has to do with how familiar I’ve become with the Viva Hysteria! DVD as well as their discography. Oh yeah, and I also play in a Def Leppard cover band. There are a few moments that did stand out though. Joe Elliot came out to sing “Two Steps Behind” all on his own, accompanied only by a lone acoustic guitar. Rick Savage had the stage to himself for a moment while he played an interesting prelude to “Rock On”. Overall, “Rock On” works better as a live song than it does as a recording! Rick Allen had his moment in the spotlight with a drum solo after the obligatory “Bringin’ On The Heartbreak/Switch 625” medley. Vivian Campbell had a neat guitar solo on “Promises”, where no guitar solo exists on the original recording. “Paper Sun” was an unexpected song choice to add to the set list, but I greatly appreciated it, as it really is a great song. These were some of the more memorable moments that I took away from the show. If you’re Def Leppard, despite your extensive discography, you can’t venture too far out of the mould. The crowd is expecting to hear a dozen or more of the well-known hits from High ‘n’ Dry, Pyromania, Hysteria, and to some extent Adrenalize. This is exactly what they delivered. That’s where songs like “Paper Sun” and “Rock On” really had a chance to stand out. With “Pour Some Sugar On Me” finished, the band left the stage shortly after 10. They returned for two encores, “Rock Of Ages” and “Photograph”. With a band like DL, you can really take your pick for encore songs. As long as they play one of their many hits, the fans are good to go. As for me, I just focused on having fun. I’m no stranger to DL’s catalogue at this point, and there’s only so much I was going to gain from paying attention to every detail. But I will say that the production, the light show and video presentation was fantastic. The sound still left a little to be desired, but overall it was pretty good. The vocals were quite audible, and the drums were front and center. The bass guitar tended to blend too closely with the kick drum at points, creating a dull woofing sound, but was better at other times. The guitars could have been louder. They could obviously be heard whenever they were boosted for solos or lead parts, but again had a tendency to blend into the background at certain points. However, overall, I felt it was an improvement over last time, and that’s what really counts.